I remember that area from when I was a child in the 60s and 70s and so my memories are probably simplistic and incomplete. I don't recall it was ever a "thriving commercial and retail area" as they say. It did ok, but "thriving" seems a little optimistic. There was definitely nothing upscale about it. You went there for sort of the same things you’d go to Wal-Mart for today. We had relatives who lived behind the center, and I seem to recall a store there (Kings?) that my mother liked to shop at for inexpensive kids’ clothes and such until one time she was accosted by an overzealous security guard for stuffing a used tissue in her pocket and vowed to never step foot in there again. (Given it was Christmas time, the guard apologized profusely for the misunderstanding, and rumor had it that shopping center had a very high rate of shoplifting even then (this was in the early 70s), she probably should have cut the poor security guy some slack. There was a grocery store (Colonial? ), a laundromat, and a "Broasted Chicken" restaurant near the right end. We patronized each but Renee is right, it was never "thriving" although convenient. Easier to get in and out than Northgate eventually became. I belive there was a Colonial foods where the Lowe's Foods now operates. The northern section later had a Big Star and a Rose's. In the mid 80's when we uses to loiter in the parking lot after hours, this was known as 'cruising' to gearheads and hotrodders, Mr. Wellons would come and shoo us off. On the other comments...maybe thriving was not a correct term, but it was always busy. When Wellons Village first opened, it was a BIG deal, as Durham was finally seen as a city which had a shopping center! We traveled from West Durham to check it out. Imagine shopping where parking was so easy -- not like downtown curbside only parking at the time. There were no parking garages back then. I cannot remember what shops were first there, but I think there were some upscale shops from downtown, who were trying out the experiment. Jones and Frasier Jewelry Store, the very long standing upscale jeweler in the 100 block of Main Street tried to revive its business by moving to Lakewood Shopping Center to no avail. Do I recall a Grant's discount store in the strip mall circa 1970? I definitely remember King's discount store across the street with its logo of a cross-armed businessman; grinning, winking, pipe-smoking and sporting a crown. Red and yellow were its corporate colors. Automotive department was in the back right rear of the store. Many moons ago, perhaps some lost/added embellishments? I'f forgotten about the pipe-smoking be-crowned logo, but now that it's mentioned, vaguely recall it. I think they took his pipe away and made his head bigger in proportion to the body at some point, didn't they? Colonial Store was on the east end of the original shopping center near the Chick 'N Treat restaurant. Big Star was next to the King's store (later Rose's) on the north end of the shopping center that was across the street and added later. I also remember and S&H Green Stamps store in the early 60's. There was a barber shop where I got my hair cut often as a small boy. The map in the Plan outlines what is labeled as "Wellons Village" (the shopping center and various points south), but the discussion in the document distinguishes between "Wellons Village Commercial District" and "Wellons Village Neighborhood", which is defined as north of the area labeled in the map. This makes some of the discussion a bit muddy. 2. From the Durham Crime Mapper, it looks like crime is a notch higher in the neighborhood just south of the Wellons Village Commercial District, in comparison to the Wellons Village Residential District. 3. It's worth clicking on the Google Map to see how the trees have grown since the residential area was built. I wonder whether the Wellons development was cleared farmland immediately before it was built, or (in some bizarre act), a swath of forest was cleared to build houses on bare lots. In the 60s, was a Colonial grocer, a W.T. Grants, Kerr Drugs, a hobby store with a slot car track next to it, a dry cleaners at the end. Remember the record store within the center area? Yep, I recall Kings and Big Star and how on Friday or Saturday nights, Austin ? of WTIK radio station would broadcast country favorites from his portable radio transmitter resident within his Volkswagen van. Behind all was the coolest neighborhood with the coolest kids, until it years later. Wellons had one of two bowling alleys in Durham were I spent every saturday morning sliggin balls down those shinny waxed alleys. Those were some good days. Yep, I to recall the barber shop, and S&H green stamp shop. Do you recall when bands played outdoors in the parking lot during hot summer evenings? For some reason I remember helicopter rides with Santa Claus. Am I dreaming? My memory is not the best but that definitely was an event at least 1 year. I don't remember much about early 80's Wellons Village except the Roses (I think), Kerr Drugs, and Byrds grocery store. There were actually 2 Byrds for a short time. Right across the street from each other. 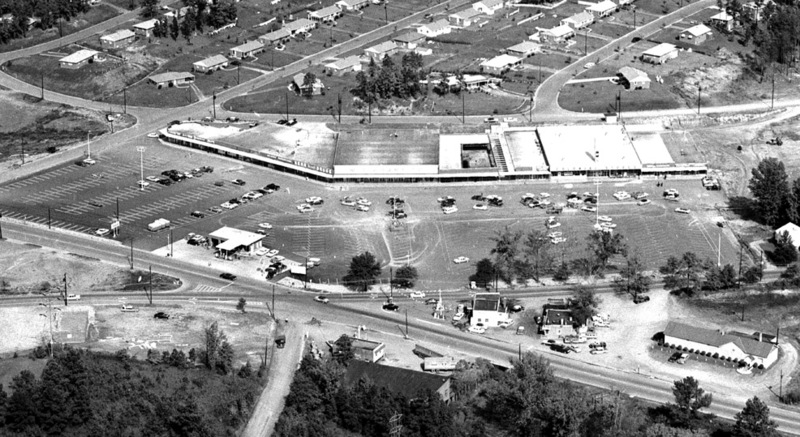 Mom used to say "let's go to the new Byrds, not the dirty Birds"
My father and grandmother built and opened Lakewood Shopping Center in Dec 1960. They kept several newspapers of other Shopping Centers opening in the area, including WELLONS VILLAGE. I have a copy of the May 28, 1959 Durham Morning Herald on the Opening of 8 new WELLONS VILLAGE SHOPS. The new stores were :(The first in Durham W.T. Grant Department Store, Kerr Rexall Drugs and Mill Fabrics, Inc.. The other new stores were: The Appliance Center, Cooley's Laundromat, Chick-N-Treat Rest., Mrs. Stevens Candy Shop and Scotty's Do-Nut Co. Ads for the other stores there in 1959 are: Colonial Foods, Village Hardware, The Citizen's National Bank, Tire and Appliance Center, Village Barber Shop, Village Beauty Salon, Friendly Florist, Sherman-Williams Paints, Johnson's Gulf, Cash’s Shoe Service and Wellons Reality Co. I am sure I missed a few, but I have an entire section with pictures and ads for the new stores (inside and out) and would be glad to share it with Gary if any of you are curious FYI The Grand Opening for PARKWOOD Shopping Center was on Dec 11, 1962 NORTHGATE was ready to start building in 1959, but protests from the neighbors slowed them down. They opened in 1962, I believe. I'd love to see the photos and articles you refer to in your post. I spent my summers there Ave and spent a lot of time at Wellon's Village first with my mom and grandmother. I remember sitting with my mother outside Kings at the end of summer when a helicopter would fly over and drop balls that all the kids would chase. Inside would be coupons for half off or a free pair of PF Flyers. I spent some time at the S&H green stamp store as well as the remnant shop with my grandmother. Good times! I remember seeing Santa there. There was also a fall festival at which I won a carton of Coke. There was post office. A friend of mine bagged groceries at the Colonial. I went to school with the Wellons daughter until they moved to Butner. I grew up with the Wellons children. We went to church together along with another family named Minshew. Mr. Minshew owned a jewelry store in Wellons Village, and actually lived around the corner in the Wellons Village neighborhood on Benning Street. I spent many hours in and around Wellons Village. Many happy memories. I just found this site today (5/30/14) and am so excited to have refreshed memories of the 1960's from this area. I was very young but remember a little café that sold hotdogs......5/$1?? Was it Rinaldi's? Do you have any info that might clear my memory about this? For some reason I keep thinking it was a new Kentucky Fried Chicken café owned by Rinaldi.......but years have dimmed my memory - but I recall they sold the hotdogs as a special on Friday's?? Also there was another drive-in café I believe would have been on the southeast end that sold other things and remember stopping there on curb to get Country Ham sandwiches. Would like to hear if you know anything about this. Thanks for the memories! I remember walking from Joyland (Wake Forest Hwy) to Wellons Village as a pre-teen. Several of our friends & neighbors would all walk together during the summer. It was a lot of fun for us, to get ice-cream at Tastee-Freeze, then go to W.T. Grants, Kerr Rexall, and to King's Dept. store (when it was added to the other end of the shopping strip). We would stare at the display in the Jewelry store window and share our dreams of buying the most beautiful items. Eventually, we would head over to the the bowling lanes (it was the place to be on weekends). Great memories uncovered...Thank You! Yes, there was a Colonial store then it switched over to Big Star. Yes we would cruise thought here to Northgate and back 1980. Wellons Village, the shopping center, was built in 1959 - Durham's second after Forest Hills Shopping Center, which was built in 1955. 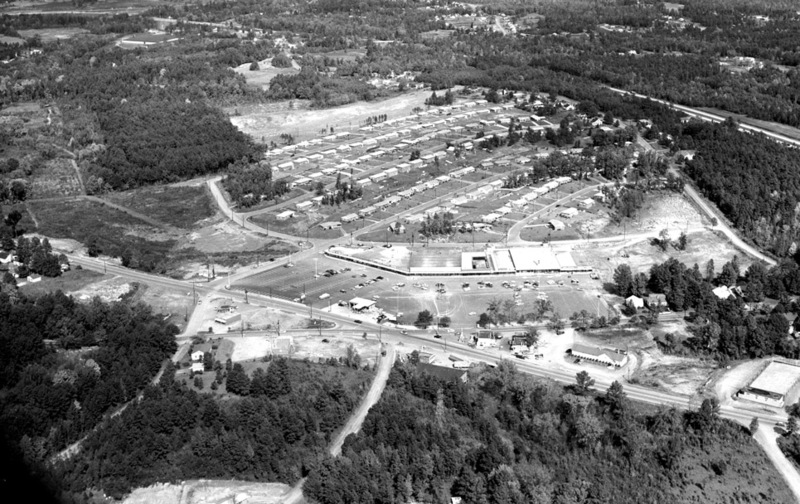 As the aerial makes clear, Wellons Village was a bit different than the others, as it was a residential and retail project - although clearly of the era, with the back end of the shopping center facing the residential development. Like Northgate, its development was tied to construction of the US 70 bypass through northern Durham in 1956-7. Closer view of the shopping center. None of the strip shopping centers other than Northgate (which converted to an enclosed mall in 1974) have really fared very well since the construction of larger enclosed malls. The large department stores / retailers that had fled downtown in the the 1960s fled the strip malls for the enclosed malls in the 1970s. After the heyday of those malls in the 1980s, they began to flee to the mega-regional malls in the 1990s. 'The Village', as it is now called, is anchored by a Maxway and seems to host a number of discount retailers. It seems similar in character to Lakewood Shopping Center and Forest Hills Shopping Center. Loehmann's is a bit different, as it hasn't had the demographics around the center change as significantly as they have around the aforementioned.